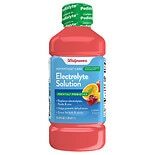 Shop Walgreens Pediatric Electrolyte Oral Maintenance Solution Cherry Punch (33.8 oz. )33.8 oz. 2 for 8 dollars and 00 cents or 1 for 4 dollars and 99 cents 2/$8.00 or 1/$4.99$0.15 / oz.